Most of the brownies I make are fudge-like, but these brownies are different. They are neither fudge-y nor cakey, but rather dense and very chewy. The recipe is from the KitchenAid mixer manual. When I first saw it I thought it was one of my favorite kind of brownie recipes — the kind that has you whip the eggs to ribbon stage and mix with melted chocolate. Those types of brownies are always really light textured and rich tasting. But this is not that kind of brownie recipe at all. 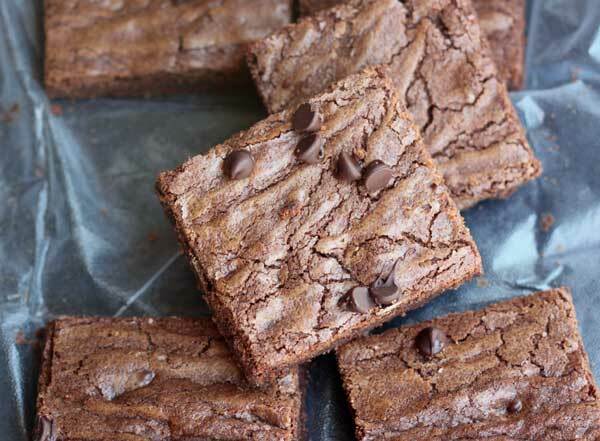 It’s more of a chewy brownie recipe showcasing the versatility of KitchenAids mixing speeds. People on Food.com gave it the highest ratings, and one person said it was her secret recipe, so I couldn’t resist trying it even though it wasn’t my “usual style”. Despite being different than expected, these were good. They had really crispy edges (which my family likes) and were stackable and easy to wrap, which are always good attributes for bake sale treats. If you make the KitchenAid Mixer Brownies, let me know what you think. KitchenAid Mixer Brownies are adapted from a recipe in the KitchenAid mixer manual. They are chewy, dense and sweet and have very crispy edges. Preheat oven to 350 degrees F. Line a 9x13 inch pan with nonstick foil. Melt 1 stick (4 oz) of the butter and chocolate in small saucepan over low heat or in the top of a double boiler; set aside to cool. Place remaining (4 oz) stick of butter, sugar and vanilla in mixer bowl. Using the the flat blade, beat on mixer speed 2 for about 30 seconds. Scrape side of bowl and increase speed to 6 and beat for 2 minutes. If the butter was still pretty cold, you might want to mix for another 2 minutes. Decrease to mixer speed 4 and add eggs, one at a time, beating for 15 seconds after each egg, scraping bowl often. Add cooled chocolate mixture and mix on Speed 2 for 30 seconds. Stop and scrape bowl, then add salt and flour and stir on a low speed until blended. Stir in nuts, then pour into the pan an bake for 30 minutes (not 45, which is what the book says). Let cool completely, then remove from the pan and cut into squares. The original recipe gives a baking time of 45 minutes, but the correct time is more like 30 minutes. If you are unsure, check with a meat probe, but at 30 minutes I usually get over 212 degrees F.
Thanks Katrina! I was going to make them again today but ended up making The Farm at Beverly Hills brownies. Are you going to pull them from the oven at 35 minutes? That sounds like my favorite kind–chewy. I need to find one that packages and stacks well to give away. I will make them. I will report back when I do! Sue, I checked around and all the versions of this recipe say 45 minutes. I too thought that seemed like a long time, but went with it anyway. The brownies don’t seem burnt, but the edges sure are crusty. So I’m confused, too. They’re not bad, just crusty and chewy. 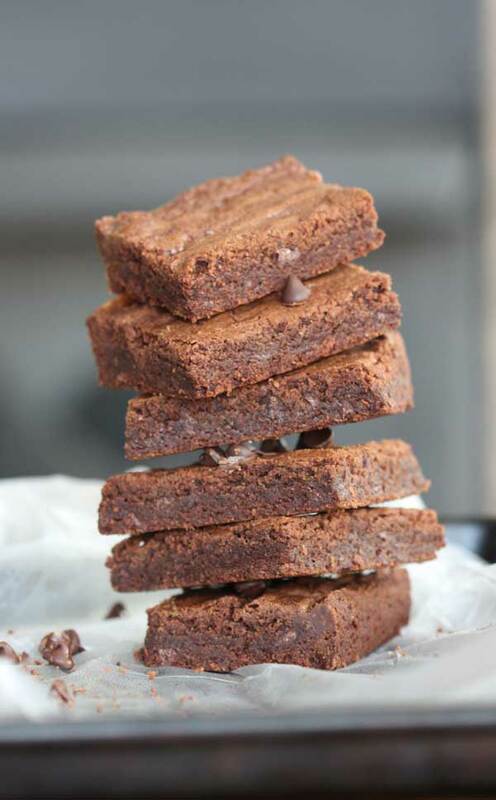 Interestingly, the famous Baker’s One Bowl Brownie recipe is similar to this but with 1/4 cup less butter and the directions say to bake for 30-35 minutes. And then you’ve got the old famous Lowney’s Brownies recipe which is similar to this one but with slightly more egg and is baked in a smaller pan for 25 minutes. So thinking about all that, the 45 minutes does seem extra long. If anyone knows this recipe and loves it and has cut the bake time, chime in! I got out my Kitchenaid Mixer recipe book and apparently I made these and liked them on July 21, 2008. I labeled them “good!”. I did note to shorten the baking time.I wonder if the texture confused me?